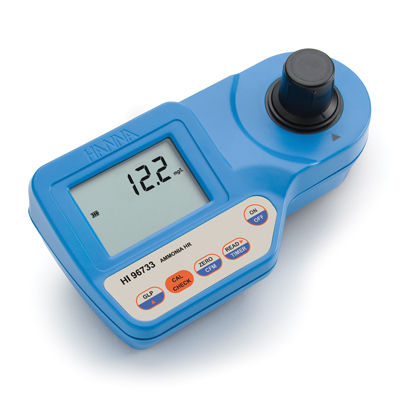 The HI 93733 measures the ammonium ion (NH4+) content in water, wastewater and seawater. Ammonia is often an excellent indication of the presence of animal or plant microbiological decay. It is tested in fish farms (fresh and salt water tanks) due to the damaging effects of its toxic nature. Its presence in rivers and reservoirs normally points to agricultural and/or civil pollutants. Ammonia is tested in lakes, rivers, portable water, boiler feed water, sewage, industrial and waste water. HI 96733 is supplied with sample cuvettes with caps (2), 9V battery and instruction manual. HI 96733C includes photometer, sample cuvettes with caps (2 ea. ), 9V battery, cloth for wiping cuvettes, instrument quality certificate, instruction manual and rigid carrying case.